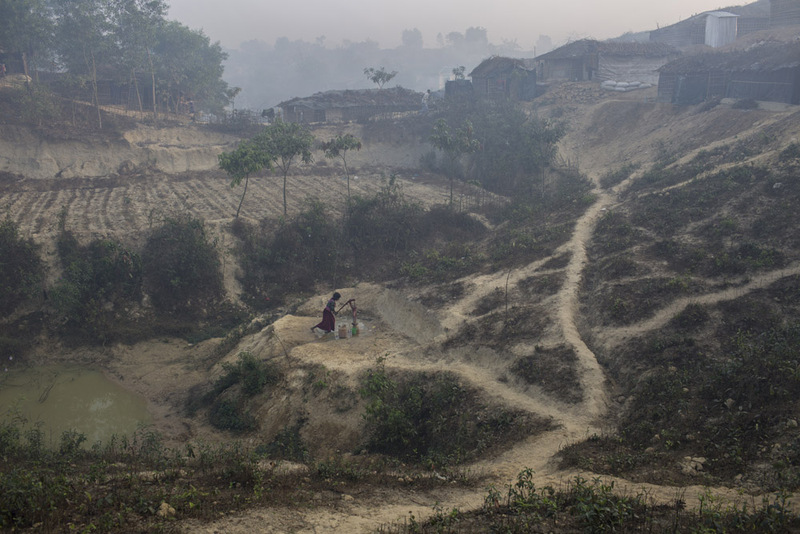 Approximately 70,000 Rohingya Muslims have fled from Myanmar to Bangladesh since October 9, 2016 after the Burmese military launched clearance operations. The U.N. human rights office said in their report that Myanmar’s security forces have committed mass killings, torture and gang rapes of Rohingyas, as well as burned their villages. Rohingyas began to flee from military oppression—first in 1978 and then again in 1991-92—in major influxes of some 500,000 people. 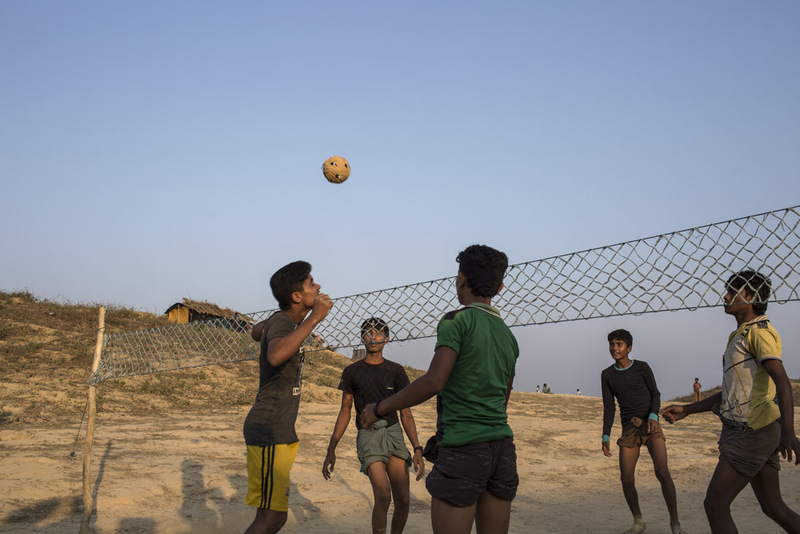 Presently, around 32,000 registered refugees stay in the UNHCR-run camps in Cox’s Bazar, while another estimated 500,000 unregistered live outside the camps. Consequently, most of the unregistered refugees are deemed underprivileged according to the scale of basic human rights. The Bangladeshi government has accommodated the Rohingyas to a certain point, but considering limited resources as well as the poor conditions its own population lives under, it is hardly in a position to resolve the issue on its own. The Rohingya refugee issue has been a long-standing problem and, unfortunately, the international community has remained mostly mute, unwilling to play a role in helping to resolve the problem. More than 35 years since it began, the Rohingyas’ crisis is long overdue for a solution. A portrait of Mohammad Alamgir, 40, and his family. 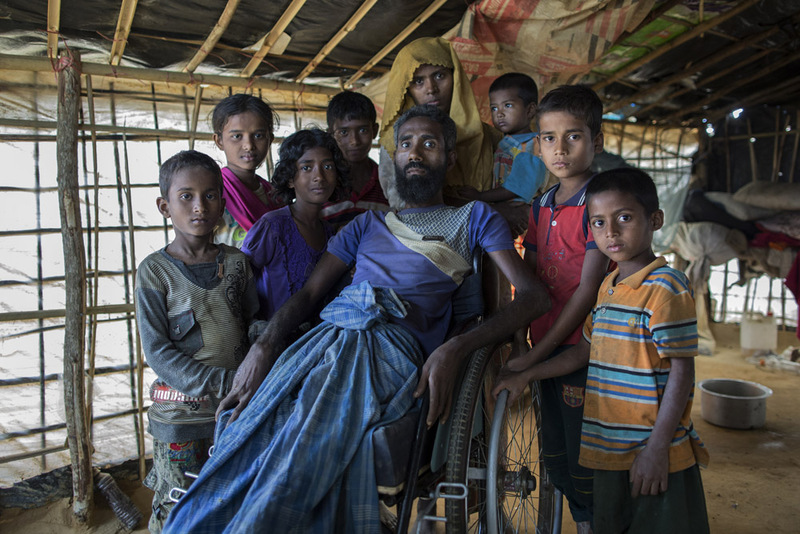 Mohammad disabled due to polio, fled with his family from recent violence in Myanmar, and has taken shelter in Kutupalong refugee camp, Cox’s bazar. 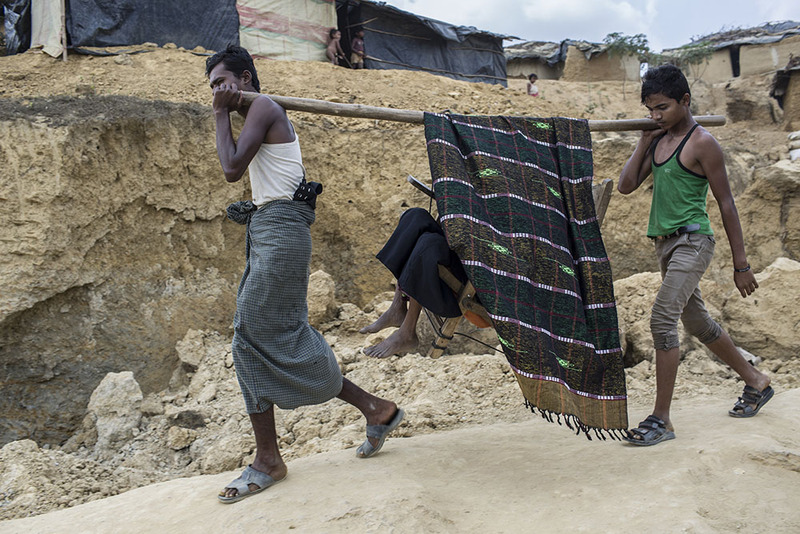 Fatema Khatun(50) is a Rohingya refugee, who fled from violence against Muslim in Myanmar, is being carried on bamboo to the hospital due to lack of transportation in Kutupalong refugee camp on March 6, 2017 , Cox’s Bazar, Bangladesh. A Rohingya woman who fled from recent violence toward Muslims in Myanmar stands at her new shelter in Kutupalong Rohingya refugee camp, Cox’s bazar. 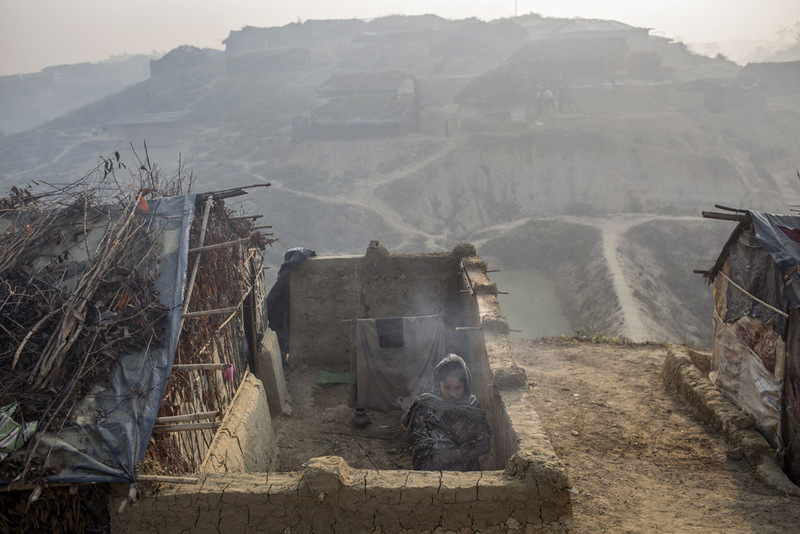 Sommaya, 7, is frightened as she has seen how the Burmese military tortured her father and burned their house. Her family fled from Myanmar to Bangladesh, and has taken new shelter in Kutupalong Rohingya refugee camp. A distressed mother, Anwara Begum, 30, holds her daughter Rozina who suffers from malnutrition. Anwara who fled from violence against Muslims in Myanmar, found new shelter in Kutupalong Rohingya refugee camp. 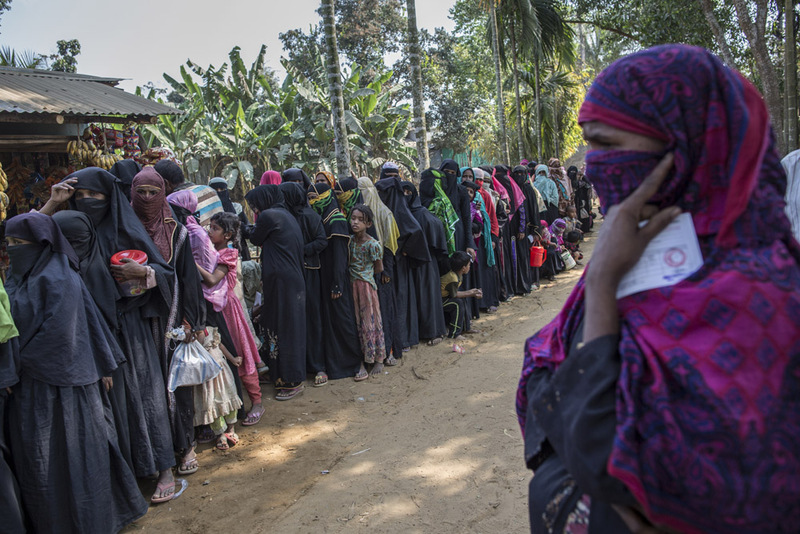 Rohingya refugees who recently fled from violence in Myanmar wait in a long food queue in Ukhia on March 5, 2017, Cox’s Bazar. 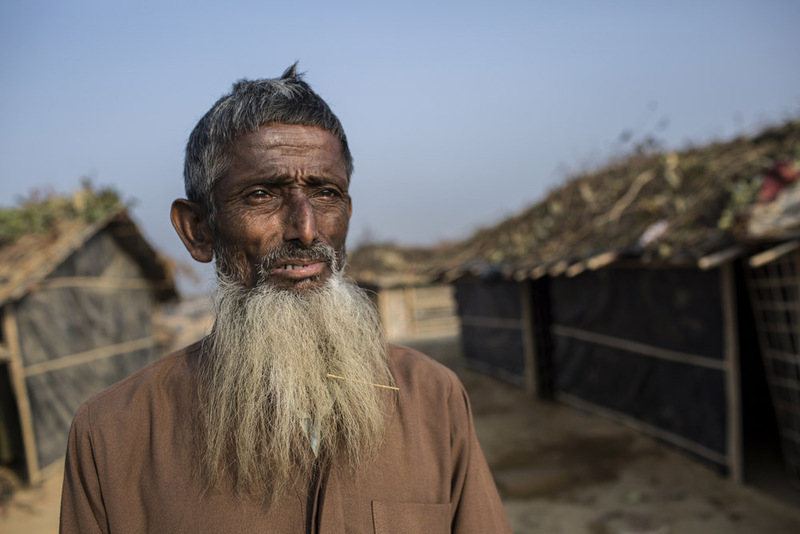 Abdul Salam,65, who fled from violence in Myanmar, stands in front of his makeshift home in Kutupalong newly expanded Rohingya refugee camp. Mohammad Muslim, 30, who fled from recent violence in Myanmar, takes shelter in Balu Kali Rohingya refugee camp, Coxs Bazar. Burmese military shot him in his leg as he was fleeing. 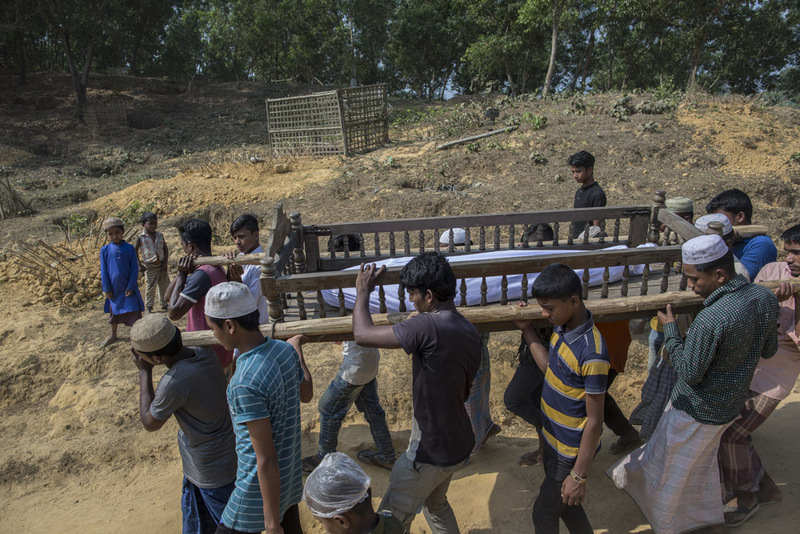 Rohingya refugees attend the funeral of Khalek, 16, who died from Diarrhea in Kutuplanong refugee camp on March 05, 2017, Cox’s Bazar, Bangladesh. 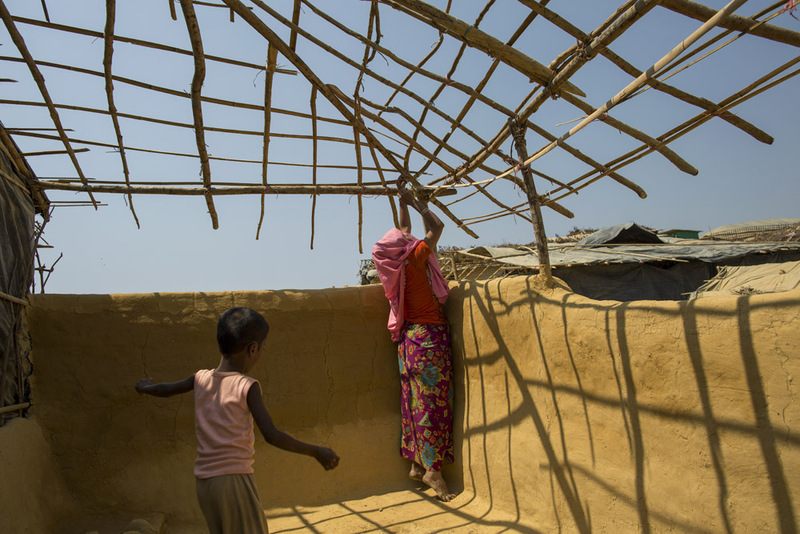 A Rohingya refugee woman makes new shelter in Kutupalong refugee camp. Rohingya women who fled from violence in Myanmar wash clothes in Kutupalong refugee cam, cox’s bazar. They always wear hijab when go outside to work. A Rohingya refugee girl collects water from a hand pump. 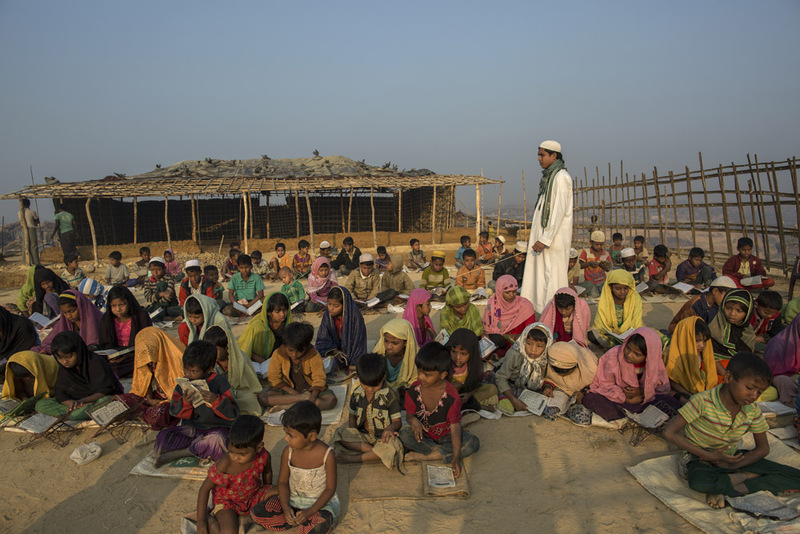 Rohingya refugee children attend an open air Arabic school in Kutupalang newly expanded Refugee Camp, where they learn to read the Quran. Rohingya children from Myanmar take their baths in Kutupalong cam. 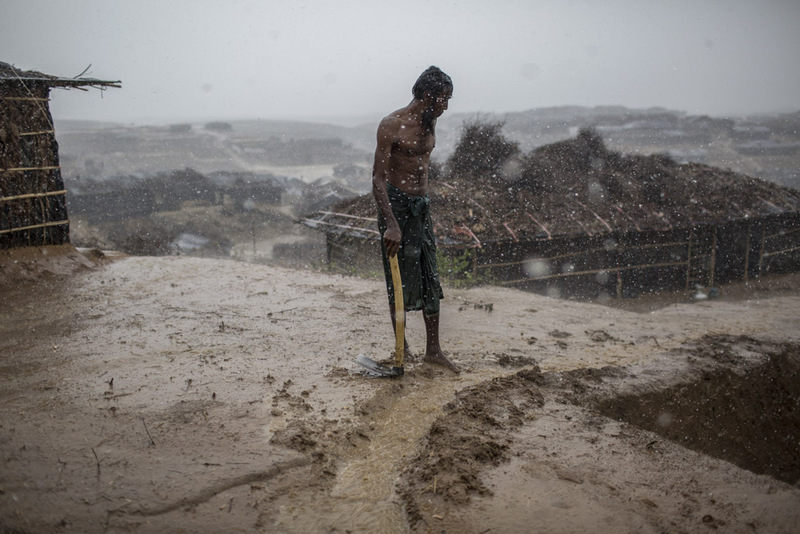 A Rohingya refugee tries to protect his makeshift home from the rain in Kutupalong newly expanded camp. 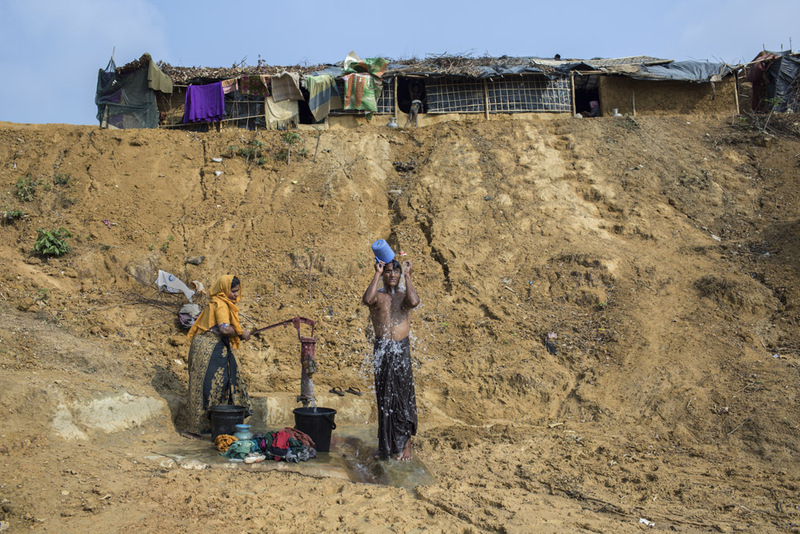 A refugee takes a bath in Kutapalong newly expanded Rohingya refugee camp. 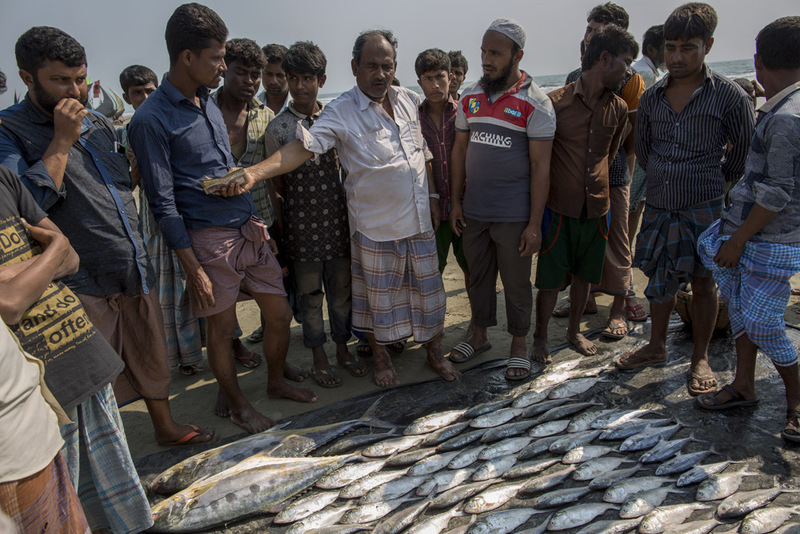 A fish wholesaler buys fish at the lowest price in Teknaf, Cox’s bazar. Fishing is one of the main sources of food and livelihood for the Rohingya refugees; however they do not get a fair price for their labor or their catch. 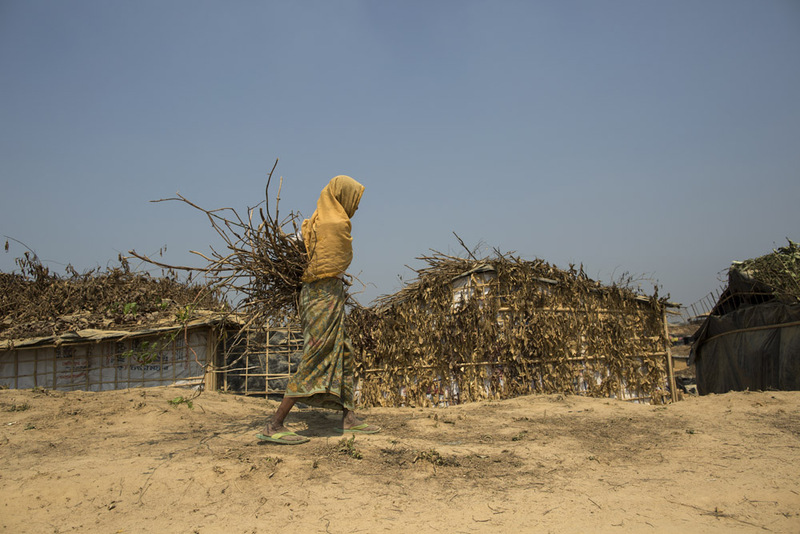 A Rohingya woman returns to her makeshift home after collecting firewood. Refugee children play with a ball made from plastic bags. His works have been published in many national and international newspapers and magazines such as The National Geographic, Los Angeles Times, Forbes, GEO, New York Post, Days Japan, Paris Match, The Wall Street Journal, Stern, The Telegraph, Focus magazine and The Guardian. Moreover, his photographs have been exhibited in Bangladesh, Germany, Japan, Thailand, Malaysia, UK, USA and some of his works selected by the Kiyosato Museum of Photographic Arts for their permanent collection.